This beautifully presented first floor apartment is located within easy reach of Edinburgh City Centre and all of its attractions, from the museums through the shopping on Princes Street and onto the many bars and restaurants in the area. 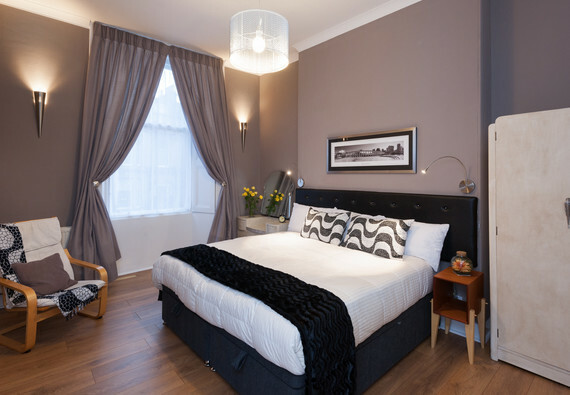 It’s just a short bus or tram ride, or a pleasant 15 minute walk to Princes Street, which is nestled in the shadow of Edinburgh Castle and the world famous Royal Mile. You will be based in an ideal location to explore Scotland's Capital City. In the opposite direction, another fifteen minute walk will take you straight to Murrayfield Rugby Stadium, home to some of Scotland's most impressive and memorable sporting events. Access to some beautiful sheltered walks along the Water of Leith down to Stockbridge and beyond, is just a couple of hundred metres away. Bus services to and from the city are also available, and are very frequent. Haymarket Train Station is just a 2 minute walk away from the apartment, for those arriving by rail. And for those arriving by plane, the airport's fantastic Airlink bus service will pick you up directly outside the terminal and stops at Haymarket Train Station, as does the new modern Tram System. The living room features a 42 inch flat screen TV, with dvd player. The whole apartment benefits from wireless broadband internet access and a good selection of TV channels. This is a great apartment for a family of four or a group of 4 friends visiting the city. There is plenty of space to settle in and enjoy a break and we have created a great space with bright and airy rooms, contemporary interior design along with all the modern appliances you may need. Large lounge with bay window, and a fully equipped kitchen. Parking notes Metered on street parking is available.